This IBM® Redbooks® publication addresses topics to leverage the virtualization strengths of the IBM Power platform to solve customer system resource utilization challenges and maximize system throughput and capacity. 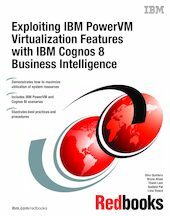 This IBM Redbooks publication will help you leverage the strengths of the POWER platform, provide implementation scenarios with Cognos® 8 Business Intelligence (BI) with the comprehensive set of the IBM PowerVM™ virtualization features, and identify and document best practices for exploiting the IBM PowerVM virtualization features within Cognos BI deployments to maximize utilization of system resources and maximize Cognos throughput and capacity. This book is targeted toward technical professionals (BI consultants, technical support staff, IT architects, and IT specialists) responsible for providing business intelligence solutions and support for Cognos BI on POWER® systems.